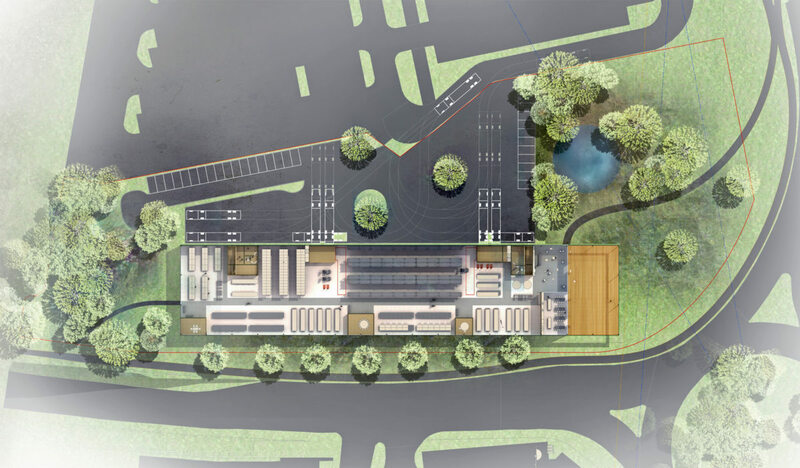 This project is a radical re-thinking of how suburban manufacturing buildings can operate at a social and urban level. 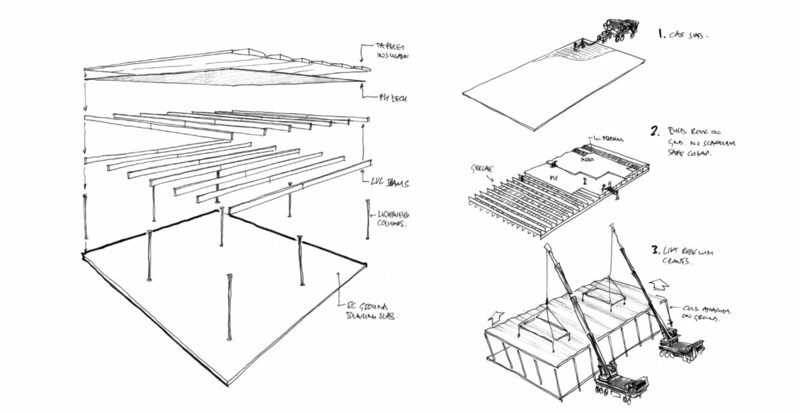 We propose that the south facing ‘prow’, this long, slender building lifts its skirts to form a large covered outdoor market hall, portico, entrance threshold, covered workspace, outdoor kitchen, market and events space. Open to the public, this great verandah can symbolise the manufacturer’s commitment to its new community and home, whilst revealing the adaptability of its experimental structural system. Framed by the portico, a double height, glazed entrance foyer of the factory could act as wonderful reception room, exhibition and museum space. The backdrop to this space, the two storey high timber SIPS wall forms a spectacular canvas for an array of shelves. From the Foyer Gallery there is a clear view through to the complete length of the building, and direct access to the kitchen. A grand civic space and entrance foyer can display products, before visitors are welcomed directly into the Kitchen and Living Room. Lofty like the grand ‘halls’ of a country house or barn, the two storey kitchen will have 180 degree views over to the kitchen garden and pond, and can open into the Portico for alfresco dining. 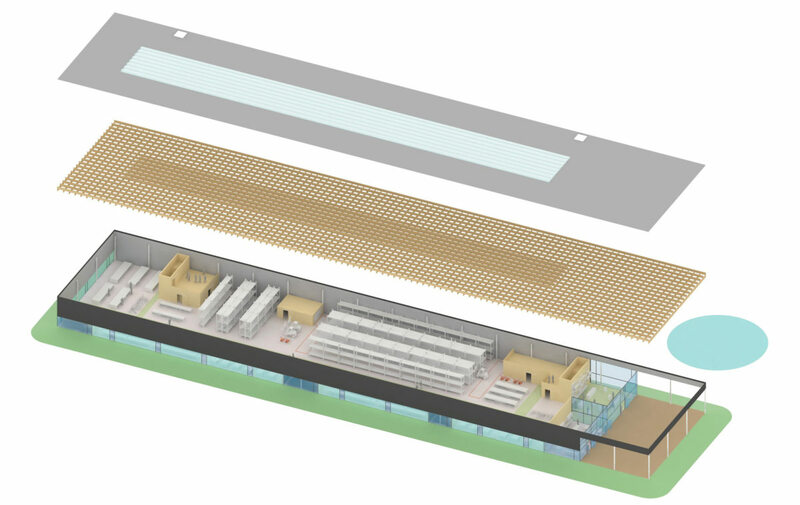 The kitchen will be the sunniest spaces in the factory and its most open, its warmth and glow visible from all approaches. 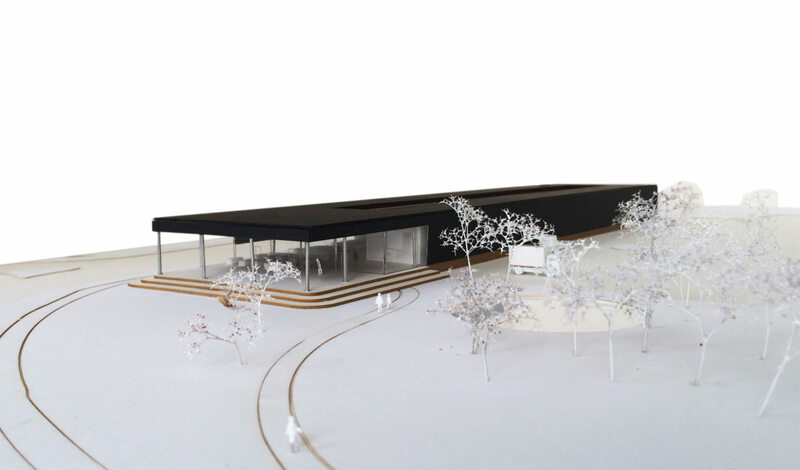 A simple, orthogonal form offers an opportunity for a pure and clean building ‘skin’ – a calm backdrop to the gardens, loading/carpark and pond. To intensify the experience of landscape while emphasising the building’s lightness, we suggest to lift the opaque insulated panel cladding above a 2.6m high band of translucent cladding. By day the building will hover above its landscape, and by night, illuminate its landscape with a glow of creative productivity.